Each transparency is 4" x 5". 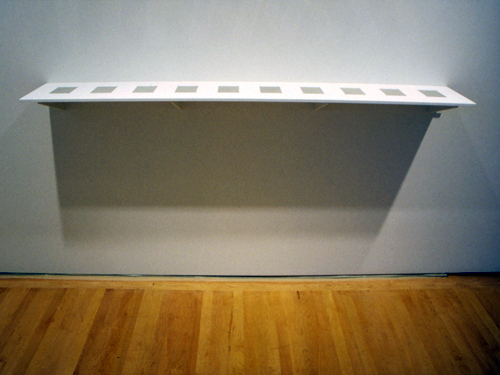 Shelf is 12 11/16" x 82"
The gallery was transformed temporarily into a darkroom in order to make the photograms in the same spot that they were later exhibited. A small pool of water was placed on each unexposed slide transparency. The gallery lights were then switched on and off. The transparencies were then dried off in the dark and put back in a lightproof box to be taken for developing. The photograms were then exhibited in their same positions on the shelf as when they were made. The transparencies were slide film, so the image of the pool of water was a positive one; i.e. the shadow was dark rather than light. The gallery lighting for the exhibition was the same as it was for making the photograms.